Client-side files (.jsp, .css, .js, graphics files, etc.). src/ - this folder is not created by default. web.xml - this file is not created by default. The portlet we just created is fully functional and deployable to your Liferay instance. By default, new portlets use the MVCPortlet framework, a light framework that hides part of the complexity of portlets and makes the most common operations easier. The default MVCPortlet project uses separate JSPs for each portlet mode: each of the registered portlet modes has a corresponding JSP with the same name as the mode. For example, ‘edit.jsp’ is for edit mode and ‘help.jsp’ is for help mode. The Java Source is stored in the docroot/WEB-INF/src folder. liferay-display.xml- Describes the category the portlet appears under in the Add menu of the Dockbar (the horizontal bar that appears at the top of the page to all logged-in users). liferay-portlet.xml- Describes Liferay-specific enhancements for JSR-286 portlets installed on a Liferay Portal server. For example, you can set an image icon to represent the app, trigger a job for the scheduler, and much more. A complete listing of this file’s settings is in its DTD in the definitions folder in the Liferay Portal source code. liferay-plugin-package.properties- Describes the plugin to Liferay’s hot deployer. You can configure Portal Access Control List (PACL) properties, .jar dependencies, and more. Client Side Files are the .jsp, .css, and .js files that you write to implement your portlet’s user interface. These files should go in the docroot folder, either in the root of the folder or in a folder structure that makes sense for your application. Remember, with portlets you’re only dealing with a portion of the HTML document that is getting returned to the browser. Any HTML code in your client side files must be free of global tags like <html> or <head>. Additionally, namespace all CSS classes and element IDs to prevent conflicts with other portlets. Liferay provides two tools, a taglib and API methods, to generate a namespace for you. If you’re new to portlet development, this section will enhance your understanding of portlet configuration options. portlet-name: Contains the portlet’s canonical name. 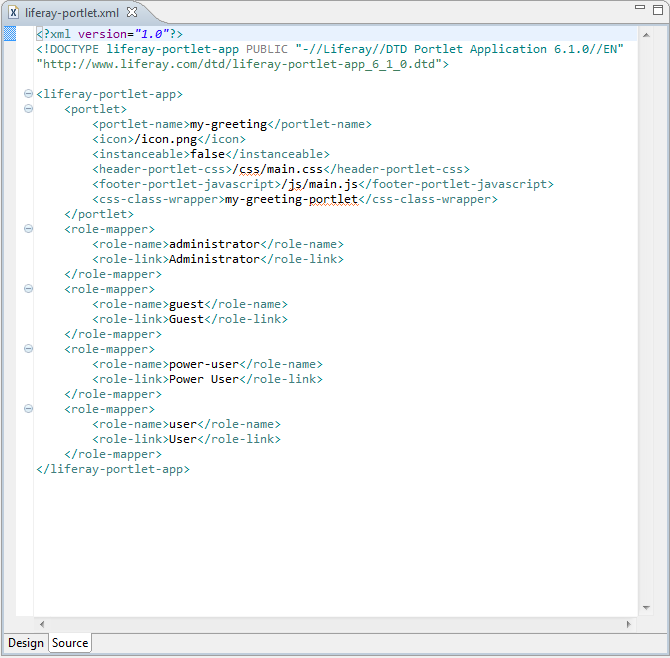 Each portlet name is unique within the portlet application (that is, within the portlet plugin). In Liferay Portal, this is also referred to as the portlet ID. display-name: Contains a short name that’s shown by the portal whenever this application needs to be identified. It’s used by display-name elements. The display name need not be unique. portlet-class: Contains the fully qualified name of the class that handles invocations to the portlet. init-param: Contains a name/value pair as an initialization parameter of the portlet. expiration-cache: Indicates the time, in seconds, after which the portlet output expires. A value of -1 indicates that the output never expires. supports: Contains the supported mime-type, and indicates the portlet modes supported for a specific content type. The concept of “portlet modes” is defined by the portlet specification. Modes are used to separate certain views of the portlet from others. The portal is aware of the portlet modes and provides generic ways to navigate between them (for example, using links in the box surrounding the portlet when it’s added to a page), so they’re useful for operations that are common to all or most portlets. The most common usage is to create an edit screen where each user can specify personal preferences for the portlet. All portlets must support the view mode. portlet-info: Defines information that can be used for the portlet title-bar and for the portal’s categorization of the portlet. The JSR-286 specification defines a few resource elements that can be used for these purposes: title, short-title, and keywords. You can either include resource elements directly in a portlet-info element or you can place them in resource bundles. As a best practice, if you’re not planning on supporting localized title, short title, and keywords values for your portlet, simply specify them within the <portlet-info> element in your portlet.xml file. Otherwise, if you’re ready to provide localized values, use a resource bundle for specifying your default values and specify the localized values in separate resource bundles. Note: You should not specify values for a portlet’s title, short title, and keywords in both a portlet’s <portlet-info> element in portlet.xml and in a resource bundle. But if by accident you do, the values in the resource bundle take precedence over the values in the <portlet-info> element. If you’re mavenizing your portlet, make sure to copy your content folder into your portlet’s src/main/webapp/WEB-INF/classes folder. For more information, see the JSR-286 portlet specification, at http://www.jcp.org/en/jsr/detail?id=286. security-role-ref: Contains the declaration of a security role reference in the code of the web application. 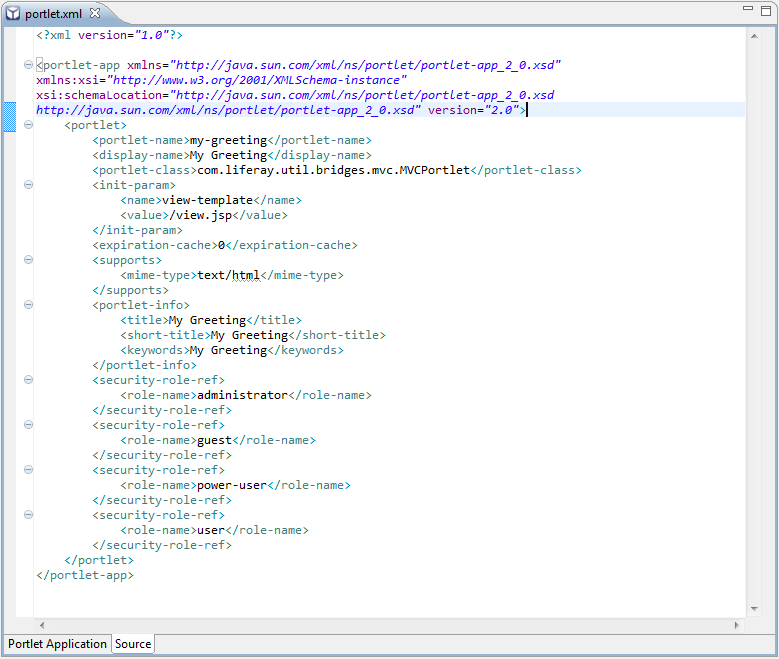 Specifically in Liferay, the role-name references which roles can access the portlet. Here’s a basic summary of what some of the elements represent. portlet-name: Contains the canonical name of the portlet. This needs to be the same as the portlet-name specified in the portlet.xml file. icon: Path to icon image for this portlet. instanceable: Indicates whether multiple instances of this portlet can appear on the same page. header-portlet-css: The path to the .css file for this portlet to include in the <head> tag of the page. There are many more elements that you should be aware of for more advanced development. They’re all listed in the DTD for this file, which is found in the definitions folder in the Liferay Portal source code.